Square Enix's follow-up to Dragon Quest Builders promises to bigger and better with a handful of new features. This includes the exciting addition of multiplayer. In the latest issue of Weekly Shōnen Jump, fresh details have been shared about this new component which was absent from the first game. According to a translation via Gematsu, a maximum of four players will be able to play and build together, while using gestures to communicate. To stand out from the crowd, each player will be able to change their character's appearance. There's also a bug-like vehicle in the game, designed by the legendary artist Akira Toriyama, that can transport everyone around. By progressing through the story, you will be able to play multiplayer on the base Vacant Island. By building with everyone and showing off your island, the range of play will expand. If you just want to show off the island you created, you can also set it so that other players cannot break or place objects. With more players involved, you'll be able to gather, craft and build much quicker - allowing gigantic structures and even statues to be created. Despite all of these details, there was no mention in the translation if this mode would be online, local or both. Dragon Quest Builders 2 is out in Japan on 20th December and will arrive locally at some point in 2019. Have you been holding out for the multiplayer component? Tell us below. 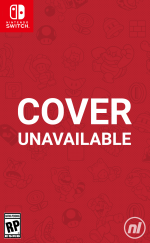 Please, be in Physical for USA release. And more vehicles , merrier. 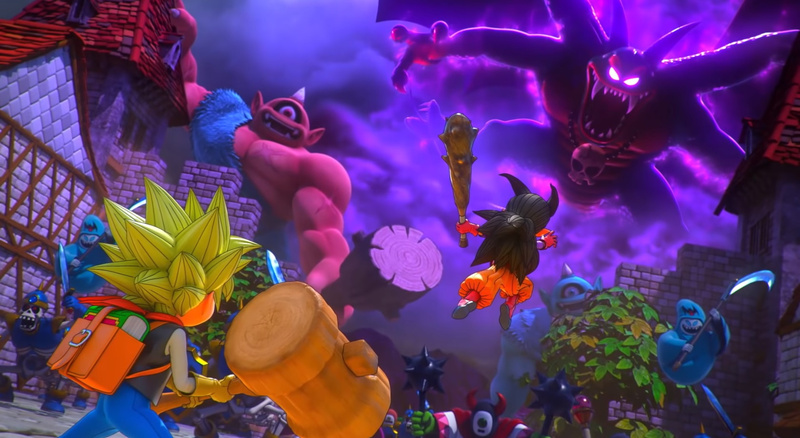 If there will be Dragon Quest Builders 3, i really hope More character customization from Hairstyle, Hair color, Eye shapes, Eye colors, Mouth shapes, Nose shapes, Top Outfits, Gloves, Bottom outfits, shoes, Accesories, Voice samples with some manipulation to lower / higher the pitch, Height adjustment, etc. 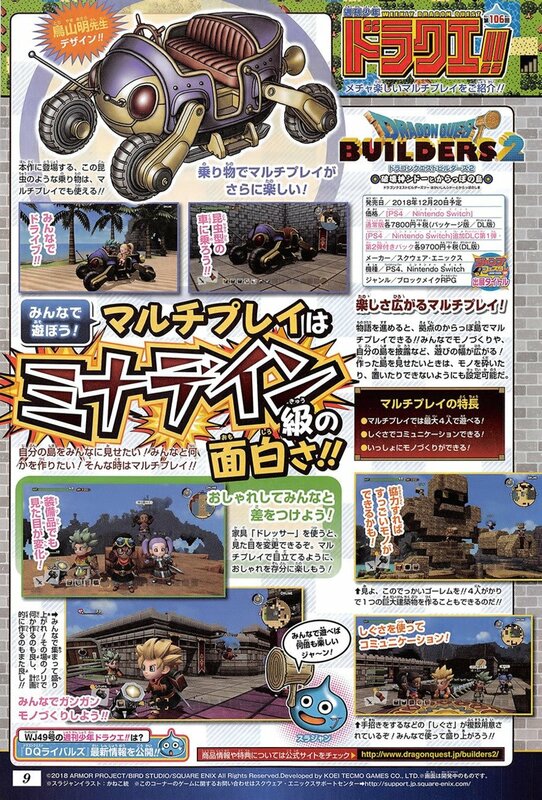 Actually, SquareEnix can create Final Fantasy Builders if they want (Imagine World of Final Fantasy Chibi characters with Minecraft aspects). If this 4 player coop mode is online and/or local, this is amazing news. Love the vehicle as well. Only other thing I really want is a little more block variety and I'm all set. Sounds promising. I enjoyed what I played from the first one but I was a bit burnt out after the second chapter and didn't finish it. I think it was mainly the having to basically start over each chapter thing that was putting me off a bit. Hopefully the multiplayer is implemented well as that could be pretty fun. A four player game. Why so many multi player games? Does multi player really sell games like this? Does the single player suffer, or does the extra work keep the price high. @Regpuppy I think when they say 4 player local they are talking about LAN... I would have loved some split screen like Minecraft. I think Squenix shot themselves in the foot when they announced Dragon Quest Builders 2 at the same time they were releasing Dragon Quest Builders. Am I the only one who lost interest in the first one because well, the price should be at most 30 dollars since the next one was around the corner? @MattFox yeah, I liked the demo and all but why would I buy it when the sequel is around the corner. I don't get it. I liked the first one, but multiplayer was something that I thought would've really made it better. It looks like 2 will fix any issues I had with 1, so if you haven't gotten 1 yet, I'd probably just say to wait for 2 instead. Perfect for my Nephew and the Switch. They will love it! @MattFox I only played the demo and enjoyed it, but you're right in that they shot themselves in the foot by doing that, as I decided to wait for the sequel. If the sequel had been further out, I probably would have gotten it. Looks fantastic. Love the little doom buggy! The first game was excellent. Bought it on Vita, bought it again on PS4, then set both aside for the 2-in-1 Switch version. I never understood why people would hold off on that game for the sequel when there's like a two year gap between. You might as well not buy any game by that logic, because there's always going to be a sequel a couple years down the line. But it's not like you can't have fun with both of them. You can fully enjoy the first game to the fullest, and still enjoy the second one. There is a single player story mode, with RPG progression after all. And the 2nd will be a different experience from the 1st. It's not like Minecraft with a generic survival mode that's being expanded upon, that makes the original irrelevant. They're 2 separate games. @zool Because Multiplayer is so much better than single player. I played the first one on Vita when there was no sequel in sight. I never did finish it- lost interest sometime in Chapter 3 because it was feeling grindy and I was tired of rebuilding my towns every time there was a plot battle. But I’m still looking forward to the second one, and will be downloading the demo as soon as it’s up on the Japanese eShop- because I love both Minecraft and Dragon Quest and I can’t wait to see the improvements they’re making. @MattFox I bought the first DQB just a few months ago, and I feel like I got more than my money's worth already. Both my daughters and I have gotten dozens of hours of play in - my eldest finished the game at something like 40 hours, I'm 50 hours in and exploring in the third land, and my youngest is just playing like it was a giant Lego set making fantastical towns in the first world. I'll definitely buy DQB2 at or near release, too. New tools and tiles, and a new story, are super enticing. But the first game is still a great game worth playing. I'd sort of compare it to Overcooked 1 and 2. I bought the first one recently even though everyone is talking about the sequel now, and the family is having a blast with that first game. It didn't stop being a good game when a sequel with more features came along. There are some good stories and funny characters in DQB1. @JaxonH Right on, and also cosigning on the "doom buggy". It is SUPER cute, and solves one of the real annoying things about the first game. Fast travel will be such a blessing. I would assume it's online and local. At the very least I'd assume online since during the initial trailer they showcased 4 players building at the same time without being on the same screen. @60frames-please I would have preferred 30 fps and 1080p... Why do you need 60 fps in a building game? Meanwhile 720p in docked mode is really ugly... I guess the best would have to have both options available. @Wanjia the local is a LAN only which means it's multiple switches over a local network... Unless there is a splitscreen option but so far everything points towards LAN which is a bit of a bummer. I do believe there will be online as well as LAN. I’m hoping that DQB’s multiplayer supports local wireless. Don’t feel like enough games take advantage of it. I had been holding out, until a couple weeks ago. My wife and son wanted the first one so bad I finally broke down and bought it for them. @dil_power Yeah, I really wish developers would include that choice more often. I strongly prefer 60 fps in every kind of game. Even in solitaire card games, such as Solitaire for DS and the Klondike and spider solitaire games in brain training on 3ds, it makes a huge difference. Touching the screen and having cards move very smoothly simply makes the games more fun and satisfying. The smooth interface of a snappy and responsive 60 fps game makes me want to come back to it and play more.